Kowloon City may not be the most convenient part of town, but sometimes, in the name of good food (Thai cuisine in this particular instance) it’s worth every single minute of your trip. 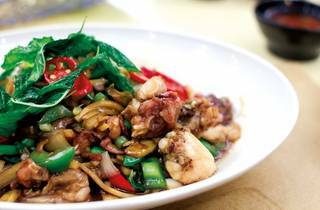 Thai Liang Zhi opened recently on the once famed food street Hillwood Road. After a quick scan of the dining room, it’s difficult not to think that someone simply passed by this location (formerly a Japanese restaurant), saw the hanging “For Rent” sign, then decided to move in, quickly apply Thai-themed wallpaper, put up countless framed pictures of His Majesty King Bhumibol Adulyadej on the walls, and open for business within a matter of days. Of course all this is possible – after all, Hong Kong is well known for its efficiency, right kids? Instead of ordering the usual suspects such as prawn and fish cakes, we let Ar Fa, the transvestite waiter working at the restaurant, recommend a few signature dishes for us. The stir-fried belacan morning glory ($50) lacked the rich shrimp paste flavour and was quite tough to chew. The familiar tom yum goong soup ($64) tipped the delicate balance of flavours with sourness overpowering the sweetness and spiciness. 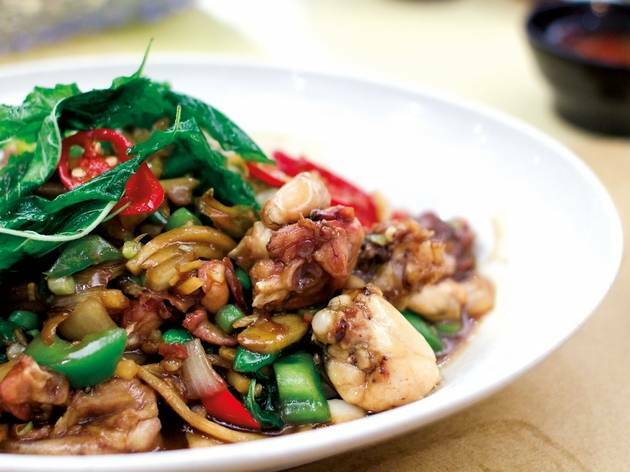 While somewhat intrigued by the stir-fried frog with chilli and herbs ($80), the dish arrived under-seasoned. Things seemed to pick up with the thinly battered yet crunchy, juicy Thai-style deep-fried chicken ($108). This was a great recommendation, which was well-seasoned and went deliciously with the chilli sauce. Sadly, our optimism was short-lived with the sea bass grilled in banana leaf ($118), which was served without the banana leaf, leaving the fish skin as the only source of flavour to compliment the dry and bland meat. The same could not be said for the crispy soft shell crab with green peppercorns ($118), which was so salty it could easily fulfil your recommended monthly sodium intake. Most Thai restaurants in Hong Kong claim their pad thai dish as the best if not most popular among patrons, but if we didn’t know better, we could not have guessed that the overly reddish, ketchup flavoured rice noodles that the restaurant served was their so-called popular pad thai ($59). Shop 2-3, G/F, 4-4A Hillwood Rd, Jordan, 2737 2330. Daily noon-midnight, meal for two: around $400.